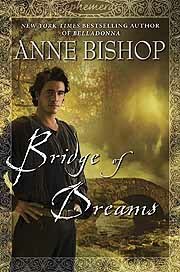 Return to New York Times bestselling author Anne Bishop’s Ephemera, a world of strange and magical landscapes connected only by bridges—bridges that may transport you where you truly belong, rather than where you wish to go. When wizards threaten Glorianna Belladonna and her work to keep Ephemera balanced, her brother Lee sacrifices himself in order to save her—and ends up an Asylum inmate in the city of Vision, far away from all he knows. At the same time, a darkness is spreading through Vision—a darkness that hides its nature from the Shamans who tend the city and its people. Danyal, one of the Shamans, oversees the Asylum. A man whose heart is searching for its own dreams, he is intrigued by Lee’s ravings about Bridges and Landscapers and wizards. With the help of Zhahar, a Handler with her own dark secrets, Lee’s body and mind improve, and his words begin to make a terrible kind of sense—giving Danyal and Zhahar a glimpse of a world unlike anything they have seen. As Danyal, Lee, and Zhahar work together to uncover the danger threatening Vision, they will be forced to look beyond themselves—and within themselves—to discover who they are…and how dangerous they can be.